Well-made items are valued and treasured for how they are precisely crafted, built with care and passion, and presented with pride. Craftsmanship is the desire for the best and the quality that comes from attention to detail. Truebeck Construction prides itself on being a true builder. Our crews – for carpentry, millwork, concrete, and casework – approach their work as a craft, so when you see it, you know an expert constructed it. Our crews add value early in the design process and on job sites by offering effective alternatives and by driving the schedule. With a builder approach and skill set, we provide an advantage to our clients through industry veterans whom have the highest standards in building and safety. Self-performing work with our own crews lets us set the standard for craftsmanship on our projects. Given the active state of the construction market, there is no guarantee that the manpower provided by subcontractors is their ‘A-team’. Our crews have spent their careers receiving extensive and ongoing training in their specific trade. By self-performing we can utilize our most qualified teams on a project, thus ensuring superior quality. 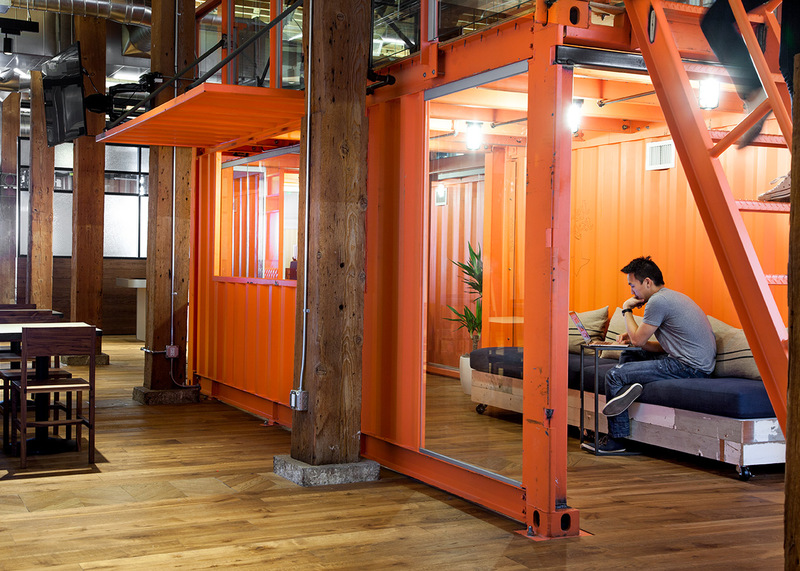 Quality defines the space at GitHub’s headquarters in San Francisco. The 55,000 square foot three-story office space is both beautiful and functional. Truebeck restored the historic building—from 1905—with modern-day efficiencies, while preserving the building’s history. Part of the team’s aesthetic vision was to restore the original wood—which had been painted white by the previous owner – and expose the timber to honor the rich roots and create a warm, comforting space. Our carpentry and labor crews were utilized for the exposed structural wood framing, historic window restoration, roof deck installation and custom shipping container assembly. The team seamlessly blended new features with preserved historic wood framing, matching the original craftsmanship of the 109-year-old building. Self-performed container assembly at GitHub Headquarters. The project team—Truebeck Construction, Fennie + Mehl, and Studio Hatch—were honored by Engineering News-Record (ENR) who recognized GitHub as an extraordinary project nationwide, and awarded it a 2014 ENR Best Projects Award. By using our own crews, we can better control the overall project schedule. This is especially true if we are self-performing critical path scopes on projects with fast-track schedules. As the general contractor, we have an in-depth understanding of the overall project schedule and are better able to sequence work if we are not subject to the limitations of subcontractors. This includes overseeing the procurement of materials to ensure timely and accurate delivery and installation. Making up time in the project schedule because of subcontractor delays is often quite difficult. Self-performance lessens the time needed for subcontractor procurement and orientation and allows us to respond immediately as conditions on the ground dictate. Self-performed work allows us to provide a highly competitive price to our clients on all types of projects. Truebeck can undertake self-perform work on a GMP basis or can competitively bid work when multiple bids are required. In the GMP approach, we typically see greater savings than that of lump sum bid approaches as the open book nature provides savings back to the client. In either case, self-performed work streamlines on-site labor and shortens the overall project schedule, saving both time and money. An additional benefit of self-performed work is leveraging our builder knowledge and creativity. One notable example involved the reuse of lab casework for a global biotech client located in the Bay Area. Originally, the design team intended to use new lab casework and Truebeck was slated to demolish the lab casework in the existing facility. Prior to demolition, our team discovered the existing casework was in good shape and salvageable for the new lab configurations. We presented the client with the cost-saving option of reusing the casework to fit the new lab spaces. After conducting a 2D CAD feasibility study to verify the plan, we cataloged and identified each piece and its intended location in the new design—which also helped us properly stage our laydown area. With this method, we could reuse almost all the existing casework for the new lab configuration. Our crew and VDC team worked hand in hand to develop a streamlined process for inventorying, modeling, tracking and installing the existing casework with a large savings to the client. 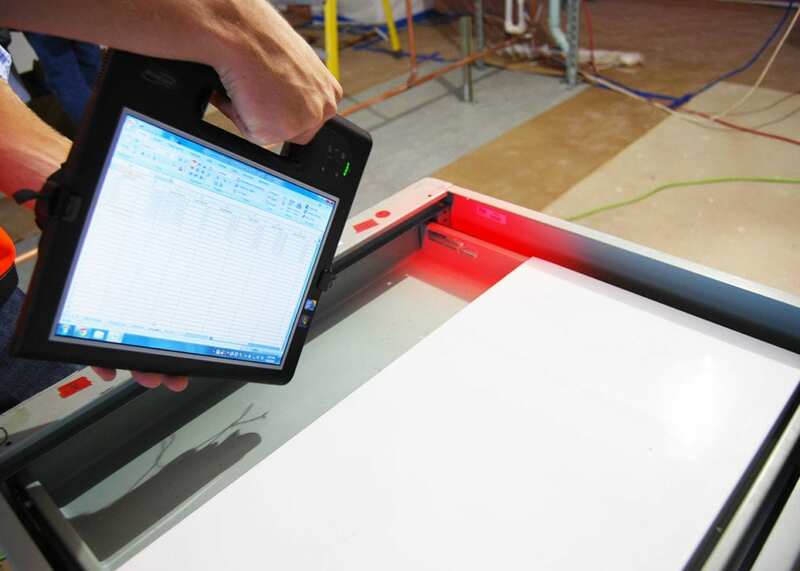 This approach – in which we developed a barcoded system to track the casework – was so successful that we employ it in similar projects across our offices. This data provided our field teams with the exact information they needed during field installation, allowing for the process to run efficiently. The savings from the reuse of material, and streamlined installation process ended up being 30% of the initial anticipated cost. 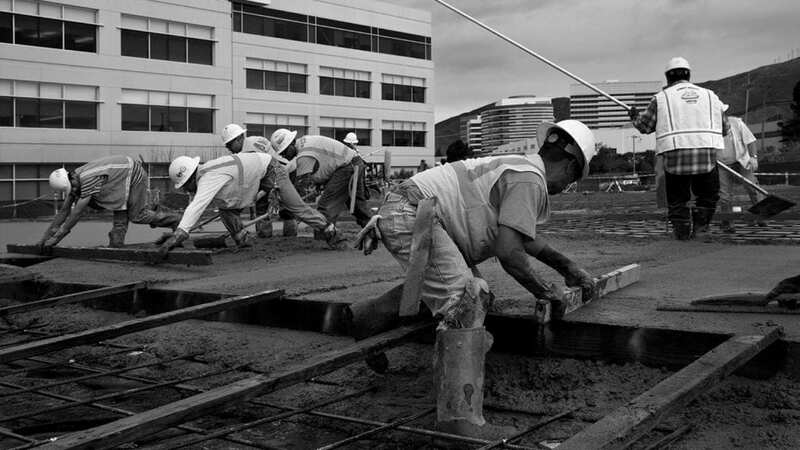 Quality concrete is critical to the success of construction projects. Whether it is a challenging foundation design, accuracy in anchor bolt layout, or quality finish in the slabs, having a crew dedicated to concrete allows us to precisely control the three most critical variables: cost, schedule and quality. 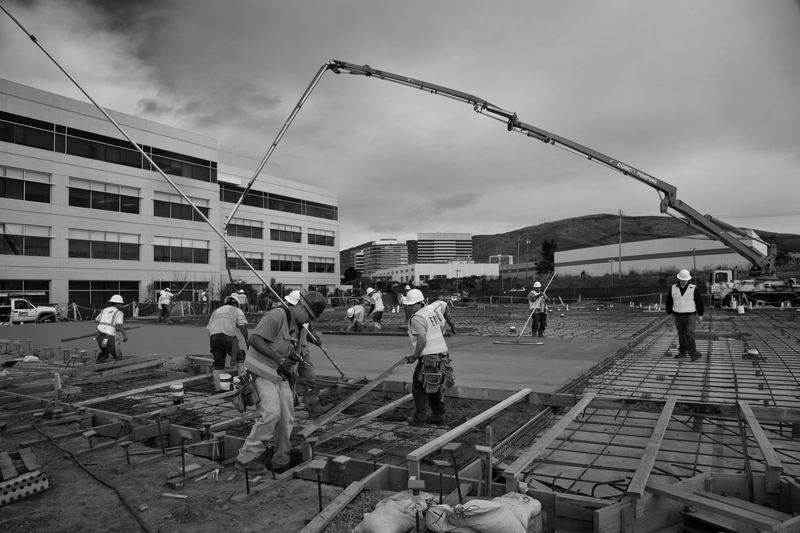 Truebeck completed a 106,000 square foot ground-up office building in South San Francisco, in which we self-performed the foundation, slab on grade and slab on metal deck – roughly 3,500 yards. Performing the work on our own was a benefit to the schedule, as we eliminated the risk of labor availability, which was prevalent at the time. With our own team, we could increase personnel on-site and complete the concrete foundation scope three weeks early—allowing us to ramp up other start dates, and ultimately save time in our critical path schedule. Self-performed concrete at 259 East Grand Avenue, South San Francisco. We leverage our craftsmen to do work many other GC’s our size cannot perform. Truebeck completed a class-A corporate campus expansion and parking structure – totaling 282,000 square feet – in San Rafael, in which we self-performed the building concrete, pre-cast panels, and garage concrete. Additionally, for the John Muir Health, Ambulatory Surgery Center and Parking Structure – totaling 327,000 square feet – Truebeck self-performed 23,000 yards of concrete. Truebeck only self-performs work if it is in the best interest of the project, ensuring competitive bids and the overall best value.